Finance ministers from the world's leading economies ripped up their support for fiscal stimulus on Saturday, recognising that financial market concerns over sovereign debt had forced a much greater focus on deficit reduction. In itself this is a rather important, if totally unsurprising, shift. Hooverism has gone global, and if our experience with it here in California these last three years is any indication, it's going to mean prolonged recession for everyone. Of course, we all knew that from the first time Hooverism was tried, so the question of the hour is, why is it being embraced globally? I've been a longtime lurker and occasional commenter here at the European Tribune, and love the diaries, whether they're extended insights on the Anglo Disease or whether they're beautiful travelogues like DoDo's bike trip across Moravia. One of my favorite genres here is the pre-election overview - these are incredibly useful guides to not just the election but to national politics I previously knew little about, such as Lithuania or Austria or Hungary. As I'm sure many of you know, the USA is a federal system of government, and although the federal government in Washington DC has steadily accumulated power over the centuries, states still retain a significant amount of control over economic and social policy. Political trends in the USA happen as much at the state level as at the national level, but state level politics have a much lower profile. American politics has been nationalized and presidentialized, and one effect is that knowledge of and engagement in state politics has declined. Below I'm going to offer an overview of the election as it pertains to my home state, California. For more about California politics visit Calitics where I am a member of the editorial board. I also founded and maintain the California High Speed Rail Blog, which I'll discuss below, and I work part-time for the Courage Campaign, a California version of MoveOn.org that has been very deeply involved in some of these races. Colton Hall in Monterey, less than a mile from my home. Site of the 1849 Constitutional Convention in California that took place shortly after the American conquest. 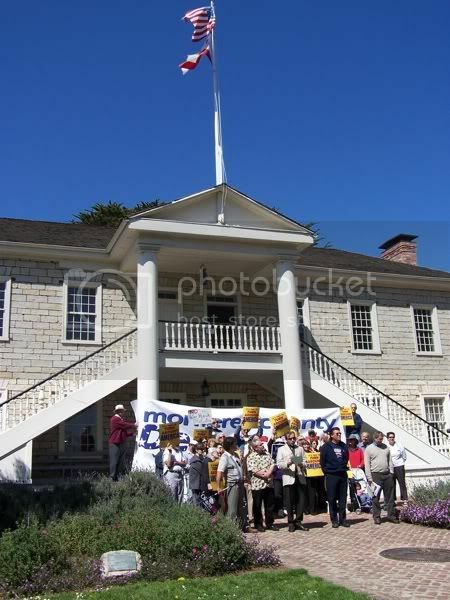 Monterey County Democrats are holding a rally on front steps, September 2008. Originally posted at Daily Kos as There Are Two Possible Futures - Ron Paul or Progressivism. Crossposted here at Jerome's request, and also because I'm interested to see to what degree this plays out in European politics. America's 21st century has two distinct political futures. This election is already seeing their emergence. The first is embodied by Ron Paul. It is a future where government is dramatically scaled back as a presence in our lives, and people are left to fend for themselves. It is a future where inequality is embraced, where those with less are given no aid whatsoever and blamed for their condition. It is a future where America tries to maintain the fiction that it is a white nation, of, by, and for white people. It is a nation racked by crisis, where survival is conditioned on how much money you make. The second is embodied by us [i.e. the social democratic wing of the netroots]. It is a democratic future, where instead of abolishing government, we both expand and reform it. Where we work to end inequality, address the multiple crises of climate and economy. Where we embrace a pluralist, diverse, international future. It is a nation that has learned to do more with less, and where basic human needs are met, not left to the market. Which future will it be?